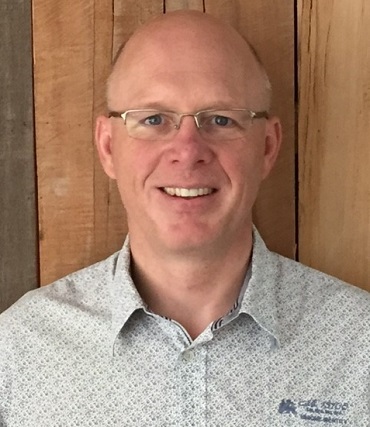 John Hall is executive director of Missions Fest Vancouver. Mission Central is inviting mission and outreach leaders to a Missions Pastors Roundtable Discussion next Wednesday morning (October 10), featuring Dr. Ross Lockhart, director of the Centre for Missional Leadership. Following is a recent reflection by John Hall, executive director of Missions Fest Vancouver and its sister organization Mission Central, on changing views related to mission and its context. Churches that participated in mission would tithe their best people with the goal of reaching the least reached, so that the Great Commission could be fulfilled in their lifetime. This vision permeated church life; to ensure that those who stayed could share in the rewards of those who went, churches committed to praying fervently and giving generously. Everyone was involved. Times have changed, but the slogan hasn’t. Instead of being a rallying cry of a triumphant church, the words “Pray, Give and Go” seem like a kitschy marketing slogan. Beginning in the late 1960s, there has been an increased acceptance of the theological concept of the missio Dei. The missio Dei expresses the idea that the work the church does, is, in fact, part of the work that God is already doing in the world. God’s mission is what spans the gap between the curse on the earth of Genesis 3 and the end of the curse in the new creation of Revelation 22” (The Mission of God’s People, p. 46). Naturally, if God’s mission spans history and affects all of creation, then all of God’s people are required to participate. At the very least, the replacement for “pray, give and go” must include the whole church. The second term, globalization, doesn’t signify who will be the mission leaders of the next era of the church, as much as it signifies what the next era of the church’s mission will look like. Globalization is the process that makes “nation-states and geographical distances . . . less relevant than ever (The Changing Face of World Mission, p. 24). All aspects of a society are influenced, from the social and cultural make-up to the economics. In the years following the 1960s, there was unprecedented growth in the church in the “Majority World.” Majority World refers to the population of people who live outside of Europe and North America (also: Global South or Southern Church). The authors of The Changing Face of World Missions note that the Southern Church will account for “70 percent of all Christians by 2025.” This is a massive and exciting shift. We need to take two things into consideration. First, as our Western mission movement matured, it encouraged the development of culturally appropriate expressions of church. This means that churches around the world are becoming increasingly diverse in their styles of worship and modes of gathering. As Western Christians, we need to challenge our preconception of what we think church “should be” to make room for meaningful expressions of Jesus’ community from all people groups. What remains constant among all faithful churches is that the world will know Jesus through his disciples’ love for each other (John 13:25). Second, because of the impact of globalization we are seeing unprecedented diversity in our Canadian cities. 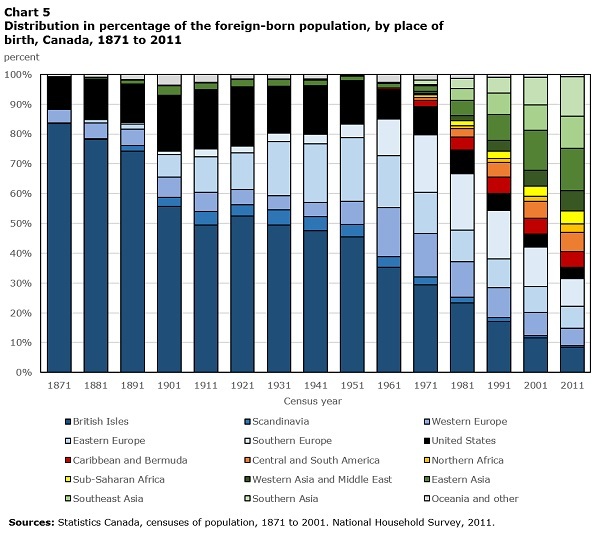 This shows up dramatically in the chart from Statistics Canada of the changes to the cultural diversity in Canada from 1871 to 2011. Many of us in the urban church in Canada are very familiar with the huge opportunity that exists to minister to diaspora communities, and the profound impact that can ripple out from these immigrant and expat disciples to their home countries. What I hope is evident is that ministry is now from everyone (the whole church) to everywhere. More than ever in the last 100 years, the North American church needs mature disciples who can discern God’s call on their lives, discern God’s place in the church and discern God’s missionary work in the lives of others, so that we can nurture what the Spirit is doing. What seems to be missing in our fragmented and hyper-individualized culture is a sense of the heavy existential threat that is framing the missional conversation. If we truly appreciated the gravity of “lostness” – not just hell, but that a life of meaning is a life in Christ – would we as God’s people respond differently? It reminds me of the UK propaganda posters from World War II. Most of us are familiar with “Keep Calm and Carry On!” There were a multitude of slogans and posters. Sometimes only one word was needed to express the action people were to take because the shared threat was so real. 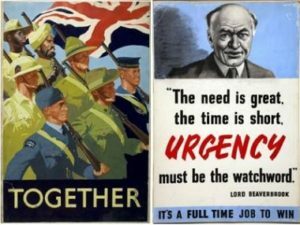 If we realized how important the cause is, could the two posters shown here be enough in our churches (replace: Union Jack with cross of Christ; Lord Beaverton with Jesus) to spark a mission movement where each of us would take our place in Christ’s mission? Each organization shares the same vision, mission and values. Our passion is to help the church be more missional. Mission Central is designed to serve the church with missional resources all year, while Missions Fest Vancouver focuses on bringing you a world class missions conference.